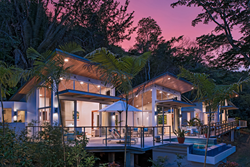 The Lodge at Chaa Creek was recently included in in the National Geographic Traveller 2017 Luxury Collection, in what the Belizean eco-resort’s owners say is further proof that sustainable tourism and sumptuous luxury can go hand in hand. Belize’s The Lodge at Chaa Creek’s recent inclusion in the National Geographic Traveller Luxury Collection is further proof that sustainable tourism can support the highest levels of luxury, Chaa Creek’s owners say. National Geographic - The Luxury Collection is the travel authority’s “annual roundup of resorts, hotels, helicopter tours, glacier trips and all other luxury experiences you’ll want to consider for your next trip,” according to their website. The Luxury Collection, which is also presented in a deluxe coffee table magazine format, features high-end hotels and resorts from destinations that include Switzerland, Bali, Ibiza, Peru, Spain, China, Canada, Costa Rica, Morocco, The Maldives, The United States and more. The Lodge at Chaa Creek’s inclusion, as the only Belizean resort, shows that the little country is coming of age and gaining recognition in the global tourism, co-owner Lucy Fleming said. It also proves that sustainable tourism can, and does, co-exist with luxury, she added. “Belize first gained attention for inland jungle adventures, ancient Maya temples and an unspoiled Caribbean coast sheltered by the world’s second largest barrier reef. As Belize’s tourism industry grew and became more sophisticated, other attractions, such as a more refined dining culture and cultural tourism began attracting notice. “More recently, and in response to visitor expectations, there’s been a move towards offering more luxurious accommodations and amenities, and it’s great to see that being recognised by travel authorities such as National Geographic. “And what’s really satisfying is that we’ve been able to gain a reputation for luxury while remaining committed to Green, sustainable tourism,” Ms Fleming explained. Chaa Creek is described in The Luxury Collection as “A balance of natural beauty and elegantly appointed thatched cottages, villas and suites, including the luxurious new Ix Chel Villas. The Macal Cottage is described as blending “stylish simplicity and elegant furnishings to create a romantic ambiance against the backdrop of the rainforest,” while “twenty-three individually designed palm thatched cottages, furnished with a mix of hand-crafted furniture, fine fabrics and local and international art,” are complemented by the Hilltop Spa’s“Naturally mineral rich mud treatments, herbal wraps and carefully chosen botanicals, sourced locally,” as well as horseback riding, canoeing, jungle safaris and other activities. Ms Fleming explained that she and her husband Mick created their blend of luxury and environmentally friendly tourism through carefully managed development. “We actually started with two small thatched roof cottages on our farm, built almost exclusively with materials sourced from the surrounding jungle. Word of mouth brought more guests, and we continued to develop pretty organically, following the natural contours of the land, building around trees rather than cutting them down and generally coexisting with, rather than attempting to tame, the natural environment. Ms Fleming said Chaa Creek continues to offer lower priced, rustic accommodations with the Macal River Camp consisting of ten small bungalows and congenial, family style dining. Regardless of the style of accommodation, ten per cent of all room revenue goes directly into environmental and community projects under the “Chaa Creek Cares” initiative, and the popular Belizean eco-resort provides training, mentoring and career advancement opportunities for its 160 employees. As a result of their efforts, the Flemings, and Chaa Creek, have been recognised with an impressive number of awards and distinctions. In addition to The Luxury Collection, National Geographic earlier this year recognised Chaa Creek with first place honours for “engaging communities” at the 2017 World Legacy Awards presented in Berlin. “We have very close ties and a warm, mutually beneficial relationship with our local communities, and it was gratifying to see this recognised internationally with such a prestigious award,” Ms Fleming said. “Mick and I, like most travellers, have always been avid National Geographic readers, and to us it’s a great honour to have been recognised by them twice this year, and for two things that are important to us – sustainable tourism and offering our guests a high degree of luxury in a pristine natural setting. “It confirms something we have been promoting since we opened in 1981, that supporting the environment and communities doesn’t need to come at a cost to luxury or service. In fact, they can go hand in hand, and that’s what true eco-tourism is all about. “And we’re very grateful to National Geographic for acknowledging this and spreading the sustainable tourism message worldwide,” Ms Fleming said.